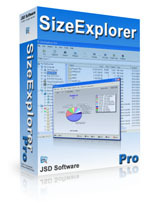 All information provided by SizeExplorer Pro will help you manage your drives easily. You will be able to rapidly spot large files that may be useless, and you'll have a good general view of the space usage distribution on your local and network drives. SizeExplorer Pro includes a viewer for analyzing your saved snapshot, a command-line tool for saving snapshots from the prompt or from a scheduler and a report generator to generate reports from saved exploration or live exploration. SizeExplorer Lite is a powerful disk space usage analyzer. It provides you with a complete set of tools to help you manage your disk space easily. Features include folder size, graphical charts, file distribution statistics and reports (by size, extension, type, date, etc. ), biggest files, file management, printing of file listing, compress into ZIP file, exports to Excel, html, xml and text files, etc. All information provided by SizeExplorer Lite will help you manage your drives easily. You will be able to rapidly spot large files that may be useless, and you'll have a good general view of the space usage distribution on your drives.